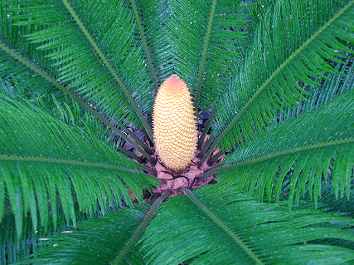 Posted on November 3, 2011 by Sofie L.
Cycads are often referred to as living fossils, as they were abundant during the Jurassic and Cretaceous when dinosaurs roamed the Earth, and it has long been believed that recent cycads are merely those that managed to linger on after the Cretaceous-Palaeogene mass extinction 65 million years ago. But now, Nathalie Nagalingum at the Royal Botanical Gardens in Sydney and her colleagues, have shown that although they look very similar to their Mesozoic ancestors all extant cycads are in fact very young from a geological perspective. By comparing DNA and fossils Nathalie Nagalingum and colleagues found that extant cycad species around the world all evolved rapidly during the late Miocene, some 10 million years ago. The driving force behind their renewed diversification in the late Miocene was most likely the climate. The continents had drifted to their current positions, and the climate became cooler and more seasonal. This may have helped cycads to thrive in the tropics and sub-tropics. I met Nat in Melbourne in 1996 at the School of Botany at Melbourne Uni. She was a young honour’s student in the old Isabel Cookson Laboratory and I was a visiting fellow doing a post-doc there. Fun times! Seems like ages ago now. Congratulations to Nat and her colleagues for this exciting discovery! Why start a science blog? There are quite a few science blogs out there already, and many that already deal with geological topics. But I have always liked to write and I hope that my posts can act as a source of inspiration and debate within the science community that I am part of, and among those who are just generally interested in geology and the evolution of life on Earth. Unfortunately, science and evolution are not as accepted as most of us working within Earth Sciences think. E.g. in 2009 half of the British population did not believe in Darwin’s theory of evolution. More than one fifth of the population preferred creationism or intelligent design, but most people were just confused and did not really see the point in believing in something that they could not understand.